The RC quadrocopter, also called the quadcopter, quadricopter, quadrotor, and unfortunately/incorrectly Drone; all fall into the classification of multi-rotor RC aircraft. They are the fastest growing development in radio controlled vertical lift platforms that are able to take off & land vertically, hover, and fly in all directions. As the name "quad" suggests, there are 4 propellers arranged in a cross type configuration. There is no single large collective pitch rotor or tail rotor that we are all used to seeing on a conventional RC helicopter. These propellers are fixed pitch, two will spin clockwise and the other two will spin counter clockwise. Because of the two different spinning directions, two of the propellers are designed (shaped) specifically for CW rotation, the other two will be designed specifically for CCW rotation. For you RC airplane people out there, you will commonly call these "normal" and "pusher" propellers. By precisely and accurately spinning these four propellers at different speeds, all the common directional movements of a standard helicopter are attainable. 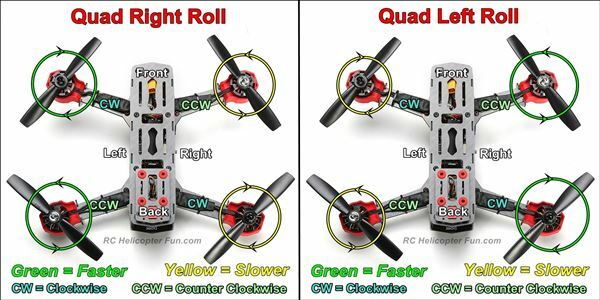 To get a better understanding of how these 4 basic quadrocopter control movements are achieved by spinning the directional propellers at different speeds, below are a set of illustrations showing which propellers are spinning faster and slower to provide lift, pitch, roll, and yaw control. Quadcopter lift control is pretty easy to grasp. By spinning all four propellers at exactly the same speed to produce the same amount of thrust, the quad should remain level. If we spin all four propellers equally faster, thrust is also equally increased and the quadcopter ascends. If we lower the speed of all four propellers equally, thrust is reduced, and the quad will descend. If we spin all four propellers at the same speed to produce just enough thrust to counter the pull of gravity, the quad will hover at a fixed altitude. Quadcopter pitch control allows forward and backward movement of the quad by increasing and decreasing the speed/thrust on the two front and two rear propellers. If the speed difference between the front and rear props is substantial, the quad will flip forward or backward. As seen in the above photo, if the rear propellers are both spinning faster and producing more thrust than the fronts, the quad will pitch or flip forward. If both front propellers are spinning faster than the rears, the quad will pitch/flip backward. Just like pitch control of a quad where the front or back propeller thrust is changed, quadcopter roll is achieved by increasing and decreasing the speed/thrust of the left and right side propellers. 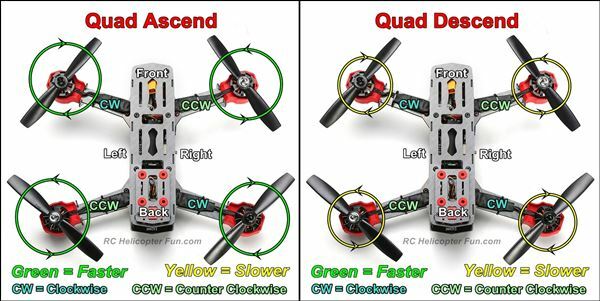 To move or roll a quad copter right, the speed/thrust of both left propellers are equally increased, while the speed/thrust of the right propellers are equally decreased. To move or roll left, the opposite speed/thrust condition is applied. Increased propeller speed/thrust on the right, decreased on the left. Quad/multi rotor yaw (turning) control is the hardest for many to grasp at first, but it too is very simple in principle. 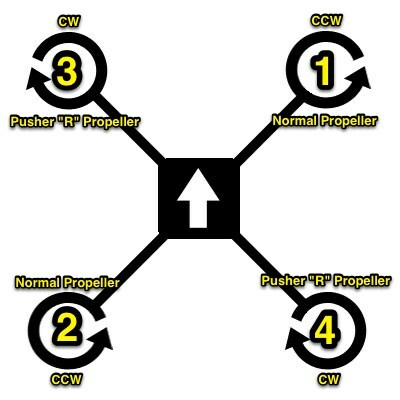 By increasing or decreasing the speed of the two CCW (counter clockwise) props in relation the speed of the two CW (clockwise) props, different amounts of reactive torque are produced between the CCW and CW propellers. 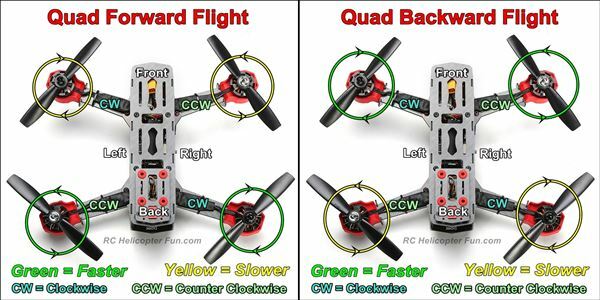 As seen in the above photo, if we increase the speed of both CCW props equally while decreasing it on the two CW props; CW reactive torque is increased, and the quad will yaw/turn/rotate to the right. 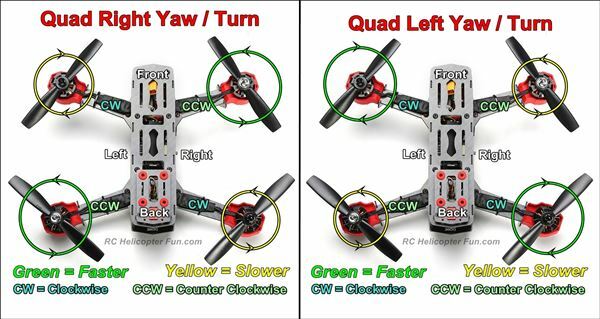 If we do the opposite and speed both CW propellers up, while slowing both CCW ones down, the CCW reactive torque is increased, and the quad will yaw/turn/rotate left. Out of the above 4 control movements, yaw control is the least reactive (strong). You are not altering thrust which can produce very strong and fast movement, you are altering torque which is not nearly as strong. This is why quadcopters can't yaw/spin/pirouette, nearly as fast as a conventional helicopter with a tail rotor. That tail rotor link goes to my tail rotor page, and shows how a conventional RC helicopter tail rotor works by countering reactive torque. Reactive torque is also explained in greater detail if you don't really understand what it is, and how it can cause something to spin in the opposite direction of propeller/rotor rotation. Quadrotor and other multirotor RC helicopters are mechanically very simple with hardly any moving parts compared to conventional mechanically complex collective pitch and even fixed pitch RC helicopters. In most cases there are only 4 moving parts on the majority of quad rotor helis; the 4 spinning motor shafts which are directly connected to the 4 spinning propellers - that's it! This also makes quad and multi rotor RC helicopters easy for enthusiasts to custom build their own machines quite inexpensively. All that is needed is the frame, the motors, the ESC's, propellers, the receiver, and the electronic stabilization system (also called the flight controller), along with LiPo flight batteries of course. The low cost & convenience of RTF (ready to fly) quads is however very attractive to most people who are just starting out. There are certainly other incarnations of the multi rotor design using as little as 3 propellers arranged in a triangle configuration, up to six arranged in a hexagonal configuration and even eight (Octocopters). For ease of explanation, I will stick with the quadrotor variety as it is the most common, and if you do end up getting this type of RC helicopter, most likely what you will be starting out with. How Do Quads & Multi Rotor Work? The reason RC quadrocopters and multi rotors are fairly new on the scene is the complex and rather heavy computing/processing power required to accurately control all the propellers to not only move the heli about, but to keep it stable. Multi rotors are inherently unstable! Only when all propellers are spinning at the exact same rate, producing absolutely equal amounts of thrust and torque, and experiencing equal amounts of drag is hover equilibrium achieved. Controlling this manually is all but impossible and only because of today’s solid state gyro and accelerometer technology, efficient and fast responding brushless or coreless motors, coupled with small, yet powerful microprocessors to deal with the hundreds (even thousands) of calculations and correction commands every second, can these things fly at all. When consumer available RC quadrocopters were first introduced almost a decade ago, they were not that performance minded as the emphasis was on easy going and super stable flight. Times have changed however and many are capable of performing some fairly aggressive and fast aerobatic flight now. FPV "Racing Quads" are also very popular, and one of the fastest growing disciplines of RC aviation; with racing series even being covered on main stream sporting channels now. Most hobby grade quads, and even some inexpensive toy quads are aerobatic these days, capable of performing fast flips and rolls, yet can be put into easy stable flying mode/s as well for beginners. In these "easy" modes, the electronics on-board simply won't let the aircraft pitch or roll past a certain degree. The electronic stabilization systems also perfectly levels the aircraft out when the control sticks are returned to the neutral "center" position. In that respect, they behave very similar to a super stable micro coaxial RC helicopter, and why they make a good first RC aircraft. The latest and greatest generation of mid priced to high end quad rotors are now sporting GPS positioning and an array of other sensors. This gives them even more fully autonomous hands off flight control, way point assigned flight paths, obstacle avoidance, "follow me tracking", and "return to home" capabilities if the radio link is lost. The level of electronic sophistication required to keep these things airborne is remarkable. They are in effect "aerial robots" since in actuality you are not flying them like a conventional RC helicopter or airplane. You are basically just telling them what to do and the electronics and programming are 100% responsible for the actual flying. Does A Quadrocopter Make A Good First RC Heli? Absolutely Yes! These make a wonderful first RC helicopter if you want the one of easiest flying experiences available to start with yet at the same time, have some aerobatic performance later on as your skills improve; provided you don’t really care about true single rotor RC helicopter flight or flight characteristics. Quadrocopters for the most part appeal to a larger group of people who just want to fly something by radio control and don’t necessarily care for a "real" conventional aircraft feel, or look, or perhaps just want one of the coolest and funnest flying gadgets around. Likely why multi rotor is showing the strongest growth and popularity over all other types of RC aircraft right now. 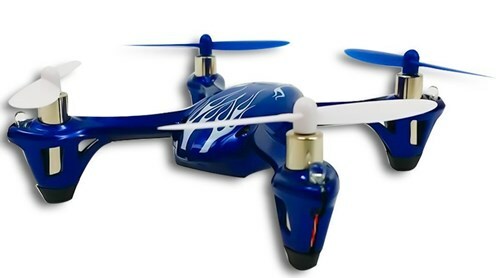 Palm Sized Hubsan H107 - One Of The Most Popular Beginner Quad Copters Ever! 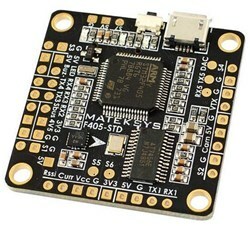 Since RC quadcotpers are electronically complex, they were also very costly; but again, as mass produced electronics and miniaturization becomes more and more common place, prices are dropping sharply. It wasn’t that long ago if you could find one of these things for a thousand bucks you were doing good, and that was for simple basic units without any sophisticated auto-pilot systems. With entry level hobby grade quad copters built for the masses, the costs are always dropping and it just keeps getting better for beginners. You can be flying and flipping tiny palm sized quads such as that Hubsan H107 for under $40 bucks! I personally don't think it's possible to cram as much flying fun into something so small, so inexpensively. These little quadrocopters rock! Blade also has some very nice micro size beginner quads. When looking at many quad and multi rotors on the market, most have a size number such as 180,350,450,550,800, and so on... What does this size number relate to? As shown here, the vast majority of quadrotors that are sized this way are referring the the diagonal distance in millimeters from each motor's center (motor hub to motor hub). Hexa and octa rotors on the other hand are measured motor hub to motor hub on adjacent motor arms. 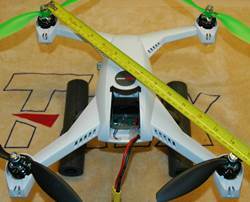 With this particular quad rotor heli, the diagonal distance from motor hub to motor hub is about 350mm. Yep, this a 350 size quadrocopter (the Blade 350 QX to be exact). With a market place that is saturate with product, where does a newbie even start looking at what might be a good quad to start with? I would start my search on my Beginners RC Helicopter Page. I have suggestions on several low cost, yet decent quality quad rotors for beginners on that page along with beginner helicopter suggestions as well. You may also want to look over my Blade Helicopter & Quad page goes over all the reasons why I like this brand better than the rest for folks just getting into the hobby. I have links to the many model of beginner friendly low cost hobby grade quads Blade has on that page. Aerial Photography (AP) & Video & FPV? Ah yes, the other main driving force behind the multirotor revolution and the absolute perfect job for them. Since these things can fly themselves, hover like they are glued in the air, have superior lift efficiency, and don't take much skill to pilot, they have become one of the most popular vertical lift and flying platforms for hundreds of different aerial photo, video, and FPV applications from real-estate to sporting events to wildlife and nature. If you can dream up a use for an "eye in the sky" - chances are there is an AP specific quadrocopter that can perform the task. 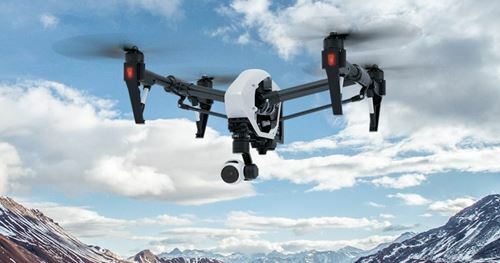 Moreover, with all the electronic sophistication and on-board autopilot systems providing a very stable and pinpoint fixed position hands off hover; they give the operator/pilot the freedom and ability to concentrate fully on camera control if he/she so chooses. If I was starting an AP business (which I have often thought about) and didn't have the time or desire to learn how to fly a single rotor collective pitch helicopter first (generally a solid year long process), a multi-rotor is definitely what I would be using. Even knowing how to fly collective pitch well, if I ever do start an AP business, you can bet there will be at least one multi rotor in the fleet. You don't have to spend a fortune either these days to get a quadrocopter heli with basic aerial video capabilities. The aforementioned Blade 180 QX for example comes ready to fly with a built in video camera that delivers fairly decent aerial video footage and stills for the low cost of around $180.00 bucks! One of the most common questions I keep getting asked almost daily right now is "what's the best ready to fly quadrocopter or multi rotor for taking pictures and video? The DJI Mavic Pro Quad Copter is without question, the current top rated & best selling aerial imaging quadrotor on the market right now. It includes everything you need such as the 4k camera and stabilization gimbal, as well as various "bundle packages" based on your specific imaging needs. The DJI Phantom's & Mavic Pro have very good GPS auto pilot & stabilization systems built-in (based on DJI's original Naza system). Over and above hands off hovering with the autopilot turned on, even if you get out of radio range or engage the "return to home" function; the GPS auto pilot systems will bring them right back to your position and auto land. Flight times are crazy impressive at over 20 minutes not to mention all the other cool technology such as obstacle avoidance and "follow me". Ready to fly, off the shelf quad-copters like the DJI's with all these features have essentially narrowed the gap between the low cost hobby variety of AP capable quads with the higher quality industrial quads. For the ultimate off the shelf aerial imaging, DJI's Inspire 1 is truly a remarkable machine that caters to true AP professionals. Last but not least, DJI also offers "Frame Wheel" quad, hex, and octo rotor kits which you have to assemble and can option out with all sorts of plug in components depending on what you want to do with them. These Frame Wheel kits are for the true multi-rotor hobbyists who want to build their own machine. DJI also has very capable stabilization & GPS systems such as the WooKong-M and Naza-M series systems. If you are serious about multi rotor, purchasing a kit along with all the support equipment is the next fun and rewarding step. I'm very impressed with DJI's Frame Wheel combo kits and have been flying the F550 myself using FPV (first person view). The latest exciting quadrocopter development is the ability for them to hover inverted and perform true 3D flight similar to what conventional collective pitch RC helicopters can do. I have an entire writeup on the topic of 3D Quadrotors - very cool.